Where are Red Sail Sports facilities located? Do you have any diving packages with hotel accommodations? What do you require to make reservations as far as a deposit or guarantee? Do I need to give exact dates I want to dive, or can that be set up when I get there? Is it possible to dive with Red Sail Sports without purchasing hotel accommodations? How many people do your boats accommodate? I’ll be taking a cruise which docks for only a day. Will I have enough time to dive with Red Sail Sports? Also, do you provide transportation to and from the port? Does Red Sail Sports offer Nitrox diving? I am trying to decide if I need to bring along my wetsuit. Could you tell me what the water temperature is like? Does Red Sail Sports offer night diving? I am not a certified diver but would like to dive with Red Sail Sports. What are my options? I am certified diver and would like to further my diving education. Do you offer an Advanced Open Water Course? I haven’t gone diving in over 2 years. Should I take a refresher course? And does Red Sail Sports offer a refresher course? I am a certified diver and my travel companion is not, how can I go diving while still spending some time with him/her? Are snorkelers allowed on your dive boats? Please give me more information about your snorkeling trips. Should I bring my own equipment or rent it from you? What do you charge for equipment rental, and do you have any equipment rental packages? Do you have lockers where I could store my equipment? I will be vacationing with my children and plan to go diving with Red Sail Sports. Can you suggest any activities for my children to do while I go diving? We operate complete dive and watersports centers featuring diving, catamaran sails, snorkeling, and various beach toys on three different locations. In Aruba, we have facilities at the Hyatt Regency Aruba Resort & Casino, Aruba Marriott Resort & Stellaris Casino and Renaissance Island. Our main office is located at: L.G. Smith Boulevard 17, Oranjestad, Aruba. At this time, we do not offer dive/hotel packages. In order to guarantee spots on our dive boats, it is best to book prior to leaving for your trip. Just like hotels and airlines, spaces are limited and can sell out. There is no set time limit to book. The earlier you book, the better your chances are of availability. For our dive only packages, a 15% deposit is billed up front and the remainder ischarged 14 days prior to arrival. We accept Visa, Mastercard, Discover and American Express. It is best to set your full dive itinerary in advance because it is based upon availability, but if you are not sure of what your plans are, the first day of diving is all we would require. In Aruba, we have two boats, the Pass Bon and the Vista Mar. Maximum capacity for each boat is 24 divers. I'll be taking a cruise which docks for only a day. Will I have enough time to dive with Red Sail Sports? Also, do you provide transportation to and from the port?Whether or not you have enough time depends on which day of the week and at what time your ship arrives and departs.Most of our dives do not take more than 4 hours (plus a half hour for registration), and we offer a la carte divingdaily in the morning and afternoon, and at night a few times a week. Additionally, we do provide transportation to or from the cruise ship dock. In Aruba, the water temperature is fairly constant at 78° . Whether or not you will need one depends on your comfort level. We also rent shorties for the day should decide that you need one. First is the full certification course. In Aruba PADI certification takes 4 days to complete at about 5-6 hours per day. Second, if you choose to take your classes and pool session in your hometown, you can then complete your open water dives at Red Sail Sports in Aruba, we offer open water referral completion. PADI/NAUI/SSI/HSA/IDEA/NASDS*.Open Water Referrals includes all equipment, consists of 4 dives, and takes 2 to 4 days. *Please call first to ensure that certification by a particular agency is available at the location you are plan to dive. Third, now there is a new way to become certified - through PADI's Virtual Scuba School! This CD/ROM or video program includes your classroom sessions and preparation for your pool sessions. The cost is the same as the Open Water Course as quoted above. You just complete the CD/ROM or video and answer the Knowledge Reviews, print it out and bring it with you to Red Sail Sports. Then you complete your pool sessions and 4 dives, which takes approximately 3 days. Please allow at least 3-4 weeks to receive and complete the CD/ROM or video program. Fourth, if you decide that you don't have enough time or want to test the waters before becoming certified, we do offer a ResortCourse for non-certified divers which includes instruction, all equipment, pool session, and 1 tank boat dive. Children must be at least 12 years to be certified or to do the resort course. Yes, we do offer an Advanced Open Water Course, and it takes 2 1/2 days to complete. We also offer other specialty courses such as underwater photography, wreck diving, and divemaster certification. I haven't gone diving in over 2 years. Should I take a refresher course? And does Red Sail Sports offer a refresher course? It is mandatory that you take a refresher course if you have not gone diving in two years. And yes, Red Sail Sports does offera refresher courses. Your friend can either become certified or take the resort as mentioned above and you could schedule your dives to coincide withyour friends. Also, snorkelers may accompany divers on some of our diving excursions for a nominal charge. Yes, in Aruba snorkelers are only allowed on the afternoon dive boats. Please give me more information about your snorkeling trips. In Aruba, we offer a 1/2 Day Luncheon Buffet Sail and an Antilla Sail. The first sail takes snorkelers to a shallow reef area where the water is very calm, a second stop at Antilla which is a 400' German freighter which islocated in about 60' of water and the last stop at the Arashi reef. The afternoon sail stops at the Antilla and Catalina Bay. That is up to your discretion. Tanks, weights, and weightbelt are provided on every dive at no extra charge and allother equipment can be rented at an additional cost. All of our equipment is re-newed every year and we have top-qualityequipment. If you bring your own equipment, we have locker facilities for you to store your equipment. In Aruba, we offer a couple of equipment packages. The "Total Scuba Equipment Package" includes BCD,regulator, wetsuit, mask, snorkel, and fins. Otherwise, per item cost per day. Yes, all locker arrangements can be made at our dive shops once you are on Aruba. 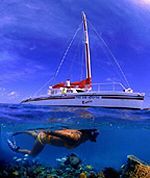 I will be vacationing with my children and plan to go diving with Red Sail Sports. Can you suggest anyactivities for my children to do while I go diving? Children interested in snorkeling can accompany divers on some of our diving and snorkeling excursions. Part of our Kid's Programs is the SASY and the Bubblemaker. SASY is snorkel device, where kids use diving equipment and non-sinkable vest for snorkeling (age 6 and up). The Bubblemaker is a program that introduces kids into the diving world, pool lessons only (age 8-11). Additionally, here are some of the childcare services that our hotel partners offer when staying there.Hyatt Regency offers Camp Hyatt- a full range of activities for potty trained children from the ages of 3 -12 years old. All other hotels are more than willing to arrange for a baby-sitter for you.